BBC NEWS | Business | How bad is the UK's pension crisis? How bad is the UK's pension crisis? 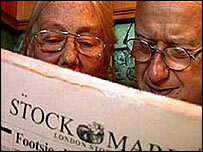 Every day seems to bring fresh warnings that Britons will not have enough money to live on when they retire. BBC News examines the issues, and explores whether we are all doomed to spend our old age in poverty. In a nutshell, there is not enough money salted away in pension funds to guarantee a comfortable retirement for today's working population. And it looks as though the total shortfall may be even wider than previously thought. In the past the government has been forced to admit that official estimates of the level of pension contributions had been inflated by a statistical error. The upshot is that many employees putting money aside for their old age may well find that their retirement income falls far short of what they had hoped. How did the pensions industry get into this mess? The underlying reason is that medical advances over the last few decades have greatly prolonged our life span, forcing the pensions industry to support a greater number of pensioners for longer periods. Government figures show that average life expectancy in the UK rose by five years for men and four years for women between 1980 and 2000. But the problem has been exacerbated in recent years by dwindling stock market returns. Pension funds depend on steady stock market returns to pay policyholders. And when share prices fall - as they have been doing for the last two years - it becomes harder for funds to meet their obligations. Lower returns have forced most of the big company-run pension funds to suspend generous schemes which guarantee employees a fixed proportion of their final salaries on retirement. A large proportion of firms have now set up defined contribution or money purchase schemes, which do not guarantee the final pension sum and are therefore less risky for companies. An additional gripe, as far as employers are concerned, is the 10% tax on dividends earned by pension schemes, which was imposed by the chancellor shortly after the present government was elected in 1997. Dividends play an important part in the long-term health of pension schemes. Any tax on them increases the possibility that the scheme will not have sufficient assets to meet liabilities. What does this mean for the average employee? It means that the amount of money they need to put aside in order to ensure a given level of retirement income is rising steadily. Experts say that a 30-year-old man aiming to retire at 65 on an annual income of £20,000 a year in today's terms would currently need to save about £260 a month. This rises to about £450 for men aged 40. For women, deemed more likely to take career breaks, the minimum saving requirement is likely to be higher still. There is still a basic state pension, but at a maximum of £86.05 per week for a single person or £131.20 for a couple, it is unlikely to fund a comfortable retirement. The low level of the state pension partly reflects a concerted move by successive governments, worried over Britain's rapidly ageing population, to encourage more people to save for their own retirement. However, that plan received a setback in the early 1990s when it emerged that many consumers were mis-sold new pensions which left them worse off at retirement than they would have been if they had stuck with their original scheme. Some say the episode has made consumers more reluctant to put their money into pensions. Should I worry if my scheme is in deficit? A deficit alone does not necessarily mean there are intrinsic problems with the company pension scheme. It is important to remember that pensions are long-term investments, and it is likely that when market conditions improve the fund will bounce back. However, you might be asked to make more contributions into the fund. People are living longer and there will be increasing demands on the fund in the future. Problems have arisen in the past when a company scheme, already in deficit, has been wound up. This has left many workers with much reduced pensions, even though they have saved all their working lives. To counter this problem the government has introduced the pension protection fund (PPF). The PPF is a type of insurance scheme which all final salary schemes have to be a member of. The PPF is supposed to step in when a pension scheme gets into difficulties. However, the PPF has not been put to the test yet. What else is being done to solve the UK's pension problems? The government has simplified the rules governing personal and workplace pensions and now allows people to defer their state pension in return for a lump sum payment. But before making any more moves the government is awaiting a report from the Pensions Commission. The Commission will make a series of recommendations on how to boost UK savings and reform the state system in November 2005. In October last year, the commission estimated that more than 12 million people in the UK were not saving enough towards their retirement. The commission's interim report published in October 2004 said that some mixture of higher taxes, more saving or a higher average retirement age was needed to solve the UK's pension crisis.